EPISODE INFO, SITE UPDATES, NEW PICS, ETC. There are A4T reviews for the latest eps now online and a few ZealousGirl reviews and Lady Conqueror reviews too. Lady C's are best appreciated in the context of the HoT BBS and its many smilies. We also have a new calendar for 2004, made by the members of the House of Tucker BBS. There are three actually - one for Trip alone, one for Trip/T'Pol and one for Trip*Malcolm. You can find them all on the 2004 ¡TRIP! Calendar page. We are blessed to have pictures from Connor's appearances at the University of Missouri, Kansas City (courtesy of gizzi) and at a charity auction in December in Laguna Hills (courtesy of bandy, wollem, and yours truly). You can find them in Connor Pics. 09.15.03 -- ¡TRIP! 's First Birthday!!! YAY! Added links in the Connor's Career page to Connor's old Circle X Theatre pages (reconstructions - the originals are now gone forever). 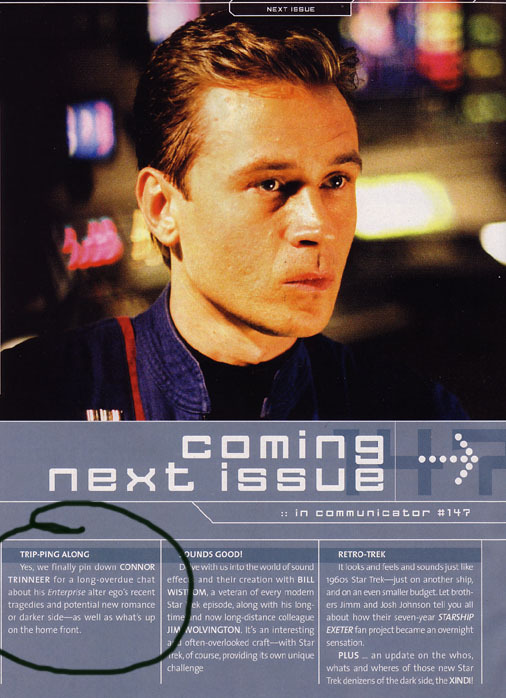 Added a pic from the latest Star Trek Communicator (Issue #146) - promising a MAJOR Trip feature in Issue #147. Subscribe now or find out who sells it in your area! 08.30.03 -- Completed a major redesign of the Trip Links page, and the Connor Links page. 08.27.03 -- Added the page "Talkin'Bout Trip" to cover all the things other people say about Trip (or the words they put in his mouth). Several comics are here too. 08.24.03 -- Added the Season Three Cast Pic . -- Added links to Greg Dean's (8/19/03) mention of Trip Tucker in Real Life Comics, as well as links to IvyMae's fantastic Enterprise cartoon pages. Thanks to IvyMae for allowing us to use this pic and link to her site. --Added a link to Trip & Jon Do the CON, over at Archer*Trip, a high roller version of Caption This! based on bandybones' exclusive pictures of Trip and Jon at the Vegas convention. 08.07.03 -- Added bandy's Las Vegas Connor Trinneer pictures. Thanks, bandybones, for providing those for our website. 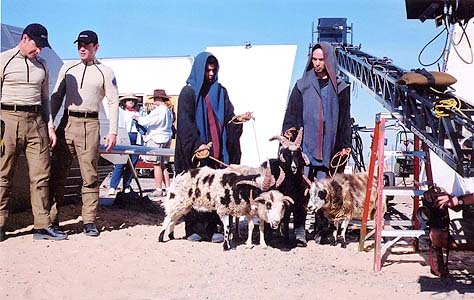 And here's a goat picture (I'm guessing from episode four?) that evay uncovered. The picture comes from the website of Performing Animal Troupe. 1. Met Mr. Trinneer in Vegas. WOW. He's very friendly, and at this convention was much more relaxed than the first time I met him in Pasadena. I told him about this website, and reassured him that it didn't focus on HIM or his personal life, just a bit about his career. He was relieved, and said that that focus on HIM was what had made him uncomfortable about web/internet stuff earlier, although he's "getting better about that" over the past year, he said. 2. I have some pics from the convention, now up in the Connor Pics page. You may link to them, but don't distribute or display the one of me with him, please. Mr. Trinneer was also given a shirt from this website, with our addresses on the back and this image on the front. He said, "This is for me?? Thanks!!" 3. Character Nugget: While I forgot completely to ask about the character, he did tell a friend who interviewed him that as far as Archer and Trip are concerned, he'd like to see a story development where they can really tear into each other, where Trip gets seriously upset with Archer. Careful readers of this site will notice that this is *exactly* what we have asked for on the Trip Bio page since September 2002. 08.02.03 -- The Enterprise Project has collected over $2,990 toward an advertisement in support of the show. That is enough to allow them to place a FULL PAGE ad in the Hollywood Reporter on September 10th, 2003, the date of the Season Three premiere. This ad will show our support for the show and the cast. 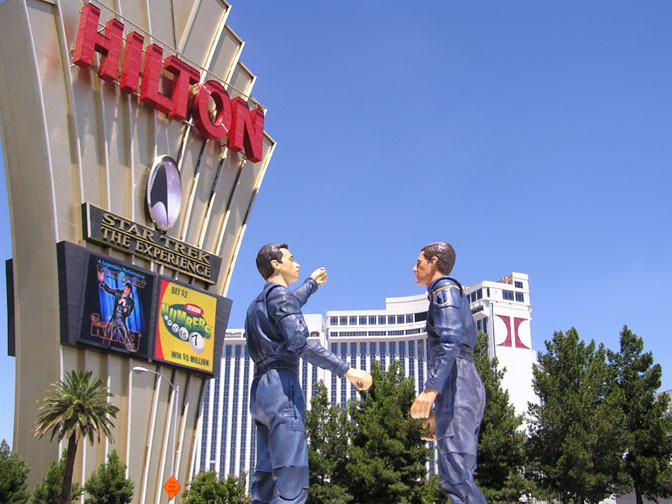 Tuckerites at the Vegas Con informed John Billingsley (Phlox) and Vaughn Armstrong (Adm. Forrest) and others of our efforts, for which they were grateful, and asked them to watch for the ad. Thanks to all Tuckerites who contributed! 07.31.03 -- Complete site redesign launched. The next major update will be toward the second half of August, after the schoolyear gets underway, and will include more information on Connor's career, more pictures, more episode reviews, and more links to other websites about Trip.